For 2 Barrel Throttle Body I have tested many springs in search of replacements for all the broken ones I have found. I also was looking for options to make the system more tunable and support more HP than the stock injector settings. I have narrowed down the options to 3 choices. 1. Stock replacement 11-14psi - This provides ~ 12psi in a stock regulator setting. 2. Performance15-20psi - This provides ~ 18psi in a stock regulator setting. 3. High Performance/late model 454 28-34psi ~ This provides ~ 30psi in a stock regulator setting. Specify your choice of spring when ordering. As most know GM used an injector that was just enough to run a stock engine. To allow the system to keep up with modifications the stock TBI pump was replaced and the fuel pressure regulator or the injectors or both needed to be adjusted. It is quite easy to calculate the new flow rate of an injector when adjusting the fuel pressure. 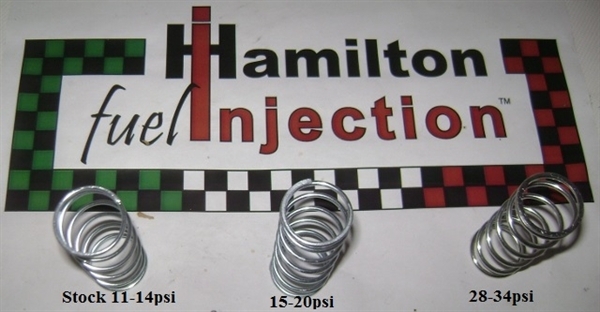 Taking a page from GM when they increased the fuel pressure on the late model 454 TBI from 12psi to 28psi and used a smaller (more common/cheaper) injector that provided better atomization of fuel, we can do the same with ours. Any changes in pressure or injectors affects the flow and requires proper tuning. But the injectors need to be able to flow enough fuel to support the HP output of the engine. So proper pressure/injector sizing is the first step. 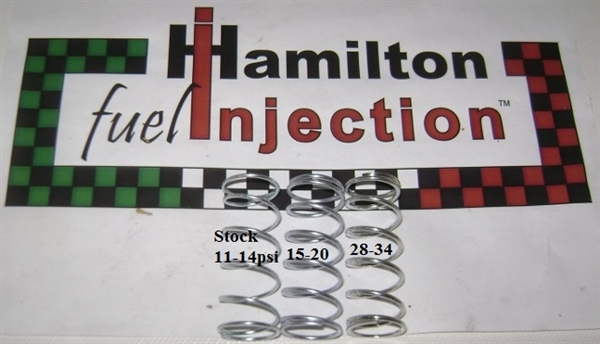 You can now select the pressure and the injector size required to match your build. Then data log and tune as required. If you have an early style regulator I can even show you a free/simple modification that allows it to be adjustable (as noted by the range of pressure for each spring). Hopefully this will help some of you other DIY guys!